In a world of fast-changing technology and increasing customer demands, retailers have often led the pack. They tend to quickly adopt and adapt new strategies and methods: email campaigns, retargeting, responsive design, and product recommendations are all tested and perfected by retailers every day. Macy’s and Nordstrom, among others, have gone even further, incorporated sizing widgets like TrueFit. The list of channels goes on, as retailers make smart moves beyond their website and consumer touchpoints: They create technology partnerships with shopping marketplaces or third-party resellers like Google, Amazon, and eBay to advertise products on their behalf. These partnerships mean that when you search for “black winter boots” on Google, you’ll see results from Target, H&M, and many other brands. But with exposure comes great responsibility. For retailers who have their businesses to run, it’s very difficult to manage all of these relationships. Because underlying all of those beautiful and diverse search results is data, all of which must be properly formatted for every single item’s SKU, color, and size, and every marketplace has its own particular requirements and possibilities. That’s where companies like ChannelAdvisor, a Signal partner, can be immensely useful. The company’s aim is to tame the complexity of the online retail space, giving retailers the power to make their products visible across multiple channels to the widest range of potential customers. Founded in 2001, ChannelAdvisor makes it much easier for a retailer to sell its products globally. Why limit yourself to the American market when you could sell in the UK or Germany by listing your wares on eBay’s sites there? 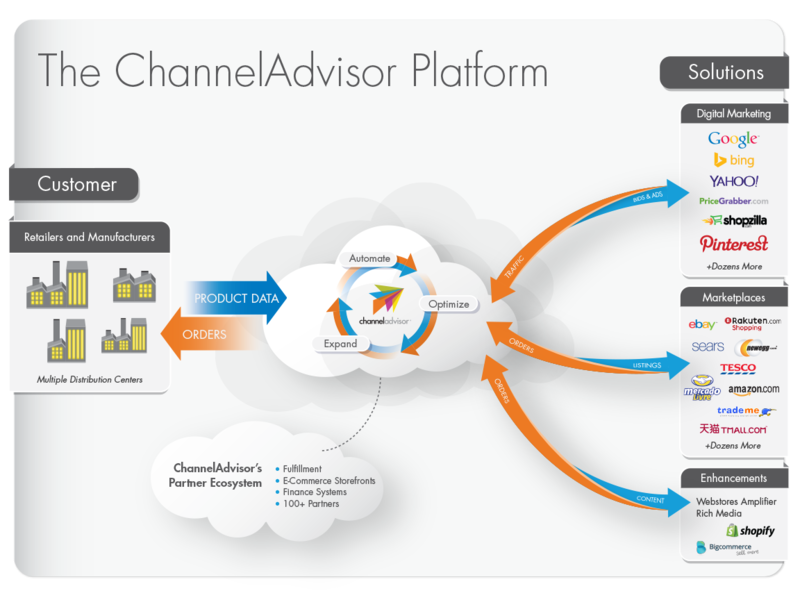 ChannelAdvisor makes it easy to standardize a retailer’s product feed for any marketplace. Their platform takes an inventory feed in spreadsheet form and converts it into forms specifically optimized for eBay, Amazon, Google, Newegg, etc. This relieves retailers of having to create a unique data feed for each channel, and helps retailers advertise on social channels and search engines. ChannelAdvisor’s Webstores Amplifier synchronizes your inventory between your webstore and all of your marketplace listings, which in turn amplifies retailers’ online reach, capabilities, and results. ChannelAdvisor also offers powerful pricing features with its Repricer technology. This tool monitors the pricing landscape for a retailer’s catalog and immediately responds to changes, allowing the retailer to design the most profitable pricing strategies for its products and have updates implemented automatically. In order for ChannelAdvisor to best leverage and optimize its technologies for a retailer’s global selling campaigns, they need real-time site-level data from those retailer websites. If the retailer is a Signal customer, they have access to a templated data integration, built and tested by both the ChannelAdvisor and Signal development teams. This integration allows Signal clients to instantly activate data collection for ChannelAdvisor for maximum campaign speed and efficiency. The impact of using an e-commerce optimizer like ChannelAdvisor can be huge. Instead of tinkering with unruly spreadsheets or constantly checking out the competition’s prices, your team can get back to building better products–and selling them to the far corners of the planet. Click here to learn more about becoming a Signal Certified Partner.